Discussion in 'Pandora, Year 1 - 7' started by Genji Shimada, Dec 15, 2017. There was a lot going on and a lot of things Genji would have to settle sooner or later. For now though, he was going to try to take it easy and just keep living. Irene was going to be throwing a Christmas party and he had to work as her bodyguard during it. Of course, since it would be a fairly proper and sofisticated party (he guessed), he needed to look good for the event himself, which meant buying new clothes. Conveniently enough, Hanzo was attending a similarly high class event and so both of them were in need of new outfits. It had been a while so Genji took this as an opportunity for the two of them to do something together, even if it was going to be just shopping and talking to each other. They had arranged to meet up at the town square by the fountain and so, there was Genji, sitting on said fountain and looking through his phone. Kaida was there as well, not on his shoulder like usual, but instead next to him and getting dangerously close to falling into the fountain herself while trying to drink from it. Without even looking away from his phone he gently pulled Kaida away from the edge. "Don't." He stated, his tone calm but definitely having a level of authority to it. Kaida just sat there at the fountain, staring up at Genji with clear annoyance, which of course meant that it transferred over to the ninja himself. Now that he thought about it, this was probably the first time he ever arrived at an appointment before Hanzo and due to that he could feel sympathy for all the other times he had left his brother waiting before. ... But he was still annoyed because Hanzo was still taking far too long to show up. Step after step, his tired feet were carrying him further down to his destination, a half empty coffee-to-go cup in hand as he tried to increase his pace to not be embarrassingly late. Even though, he slept in so late that it probably wouldn't matter at this point anymore. Crossing the streets, not looking left or right for any traffic to not waste any time, Hanzo let his thoughts drift away from the actual occasion, which was them buying new clothes for some upcoming events, away to a conversation he overheard last night. It has been something discussed in private, something that probably wasn't meant for his ears, but it was just too damn interesting to overlook, or, well, overhear. Unfortunately though, it also left him restless after his shift which resulted in little to no sleep, hence the physical and in parts mental exhaustion. Since then, his thoughts have been running in circles, burning in his mind and banging against his skull with no chance of rest. And of course he was about to meet the one who was partially part of the problem. Destiny could be so very cruel sometimes. But these voices had to shut up right now, he could make his mind up later; more important things had to be taken care of. As he spotted the fountain they were supposed to meet at, Hanzo gulped down the rest of his already ice cold coffee and threw away the cup at the next bin, clearing his throat as he approached his brother. It was no news to him that Genji too had one of these ridiculous fire lizards, so he made sure that his bag was zipped shut tightly; just a precaution. Not that another stealing attempt happened or anything. "I apologize for being late," he sounded more indifferent than he intended to, staring down at his brother, at least trying to form a little awkward smile. His gaze wandered over to the green miniature saurian beast, scanning it suspiciously before shifting his attention back to the cyborg in front of him. It sure took a while but Hanzo finally showed up. Genji looked up from his phone to look at him and was met the sight of someone who clearly did not have a good night of sleep. Seeing as this was Hanzo, this wasn't much of a surprise, but Genji still couldn’t help but worry, especially when there was a good chance of him being the reason behind it. "What happened? Did something keep you up at night?" He asked as he stood up from he was seated. Kaida seemed to watch Hanzo with as much suspicion as he was giving her, but when Genji stood up, she soon began flying and landed on his shoulder, then wrapping herself around his neck like she was some kind of scarf. Her gaze was still fixed on Hanzo though, watching his movements with suspicion. The question visibly surprised him, for it was unexpected and unusual alike. Was he really looking that bad? Sure he kind of let himself go in some aspects, but was it really showing that obvious? His gaze seemingly rested on the small dragon without even taking in the visual information but totally zoning out for a moment. He was worrying, wasn't he? To that, Hanzo simply shook his head and suppressed his weariness with a mocking chuckle, trying to hide the obvious as best as his body allowed him to. "It's been uh, a long night, yes," he said, facing Genji with a new won tired confidence and the usual attitude. After a rather long pause he shrugged indifferently. His brother didn't have to know every single little detail of his life, and Hanzo wasn't comfortable with sharing either. There was no need to, so why bother. It wasn't important anyway. With his attention focusing again on why they really were here, he couldn't help but stare at the ridiculous excuse of a dragon again, one corner of his lip going up while doing so. He scoffed. "I do not think reptile is a good choice to go by, brother. Wouldn't you prefer something more... discrete? Just a suggestion." Work huh? Somehow, it didn't feel like it was just that. Although there was the possibility of his work having some influence on it as well. Genji had a good idea of what could be keeping Hanzo awake at night, as much as he wished he wanted him to still be suffering through that, but it looked like there was no point in pursuing that topic any further. Instead, Hanzo decided to talk about Kaida. "Brother, I'm a cyborg ninja, fully dressed in armor. I am sure people would notice me far before they noticed Kaida." Genji couldn't help but chuckle, perhaps Hanzo was getting adjusted to seeing him like that after all. "Besides, we are going to buy clothes, not take part in a stealth mission. I am sure Kaida will stay in her best behavior." Genji then began petting the lizard wrapped around his neck on the head, which resulted in her perking up and raising her head with her eyes closed as she enjoyed the feeling of his stroking even if it was from a metallic hand. When Genji pulled his hand away, she stayed in the same position for a while before realizing it was over and opening her eyes, looking at her cyborg friend and lowering her head again, looking just a little disappointed. "She is a bit of a troublemaker at times, but usually if I tell her to stop she does, even if she does not want to." The tone with which Genji talked back to him... he didn't quite like it, but it had no use pointing that out. He wasn't here to scold or lecture his younger brother, well, not in that regard, but get some necessities done and maybe even get his mind off of things, actually enjoying himself for once. But Hanzo only scoffed, a shrug followed shortly after as he answered Genji's joyful chuckle with an equally amused smile. Though he had to admit, that being close to those dragons, or lizards, or whatever they were now, still gave him an unsettling feeling. Mostly because they seemed to be so unpredictable. But if Genji was around, that thing wouldn't possibly try to pull something off, right? "Birds of a feather flock together I guess," he finally said, raising an eyebrow as he watched Kaida's movements carefully. It indeed looked like a, tch, pet Genji would keep, and that irritating colour... yes, truly a companion worthy for Genji. "Anyway, this will be a first one. Seeing you finally fancy up, a sight I never thought I'd ever see." Simply the thought of it alone let him low-key chuckle, trying to picture his brother in something almost acceptable. Nevertheless, he always a freethinker, always has been. Hanzo's first comment struck a chord with Genji and he couldn't help but let out a louder than usual laugh. Now that he thought back to it, he really had described Kaida as much as he had his young self, truly this was a bond that was meant to be. Maybe the fact he was being able to discipline Kaida was just further evidence of how he had grown. "I did not think I would find myself wearing something fancy either, but fate always has some interesting twists in reserve." He commented, thinking back to his old fashion choices when he was younger, which now he could look back at with some degree of shame and bewilderment over how he had thought those were a good idea, then again, Hanzo was equally guilty. "I am interested in seeing what you will be doing as well, now that you are finally getting on with the times." He joked, his voice growing more mocking in tone. With all that said, it was time to get moving and so Genji began leading the way through the Town Square and further into River Street, eyeing all the stores close by for one that was more focused on formal attire. As he looked, a thought soon came to his mind that he voiced before he would end up forgetting about. "Have you still been keeping contact with Angela?" He suddenly asked, mostly curious, but there was a hint of worry in his voice. Oh now, wasn't he proud of himself for that remark? The worst part was probably that he couldn't even talk back, because he knew Genji was right, and besides, he really wasn't in the mood to start an argument, especially not over something trivial as that. His brother only earned a more or less annoyed frown from him, transmitting his displeasure through this simple expression. But it didn't stay for long, he couldn't help but crack a small smile at that, the tone in his brother's voice reminding him of their childish mockery back in the day. As if this part of them never went away. And to be absolutely frank, he was looking forward to spend some time with Genji again, not that he would openly admit it, but only after their last meeting he realized how much he had missed this. It filled him with a certain comfort, one he definitely needed right now. To his brother's concerned question, Hanzo only sighed deeply. Well, yes, they have been keeping in touch, though, admittingly, since the doctor's last letter, he found it hard to contain his thoughts into words. Partly because he felt uncomfortable expression them in a letter, partly because he didn't know how to respond to such niceness with simple written words...or at all. He could definitely see why Genji thought so highly of her; he himself, despite the mixed feelings, had a fairly positive first impression of the dedicated woman and was impressed by the overwhelming kindness she was offering him. Hanzo then nodded as an answer. "Yes, she's uh, really a charming woman," he added, finding himself smiling again as he recalled once again her warm concern for him. "Couldn't bring myself to write her myself though, but, yeah-"
Charming, he said. Genji could only snicker a little at the awkwardness that his brother was showing, he really wasn't any good at dealing with women, was he? Someone like Angela must have been too much for him to handle, and the fact he didn't answer her letter was just further proof of it. "You shouldn't leave her without an answer. She worries, a lot." Genji chuckled. "We spent a long time sending letters to each other when I was in Nepal. In some ways she played an important role in helping me recover as well, outside of being the one who saved my life." With that said, Genji eventually saw one store that focused on selling formal clothing and pointed towards it so Hanzo would see it, then led him inside so they could actually begin their shopping. With any luck, they would find exactly what they needed there. "Well, I am not used to wearing any of this, so it is going to be hard to tell what would look good on me..." He said, seemingly thinking aloud. Genji received a shrug, a thoughtful look from his brother. Sure, he probably was right. Her letters were so sweet and full with worry and empathy, it was just hard to wrap his head around it really. What he wanted to say was, that he really did want to answer the doctor's kind words, but didn't know how. Whenever an attempt of a reply was made, Hanzo found himself scratching out parts, rewriting and rephrasing whole paragraphs, pen pressed to the paper until the ink may run dry. But he was too proud to admit that, too proud to show his speechlessness, caused by nothing but a few neatly written words on paper. Especially not in front of Genji. But again, he definitely could see what his brother saw in that woman, and felt grateful for her existence and her permanent aid, even now. In conclusion, before they entered the fancy store Genji spotted, Hanzo only sighed, answering the request simply with "I will write her again, promise. But now, to the important things." Since Hanzo didn't really care too much for the event coming up, he didn't want to look too shabby, but not too extravagant either, just, not wanting too much attention overall. As for Genji though, Hanzo was almost exited. In their childhood days his younger and less handsome brother already refused to wear anything considered too formal, maybe to special occasion, but beyond that? No. And honestly speaking, seeing his cyborg brother dressed in a suit or the like definitely was a sight to look forward too. It would probably be ridiculous. "Just go for something that charms your eye," he said dryly, gaze already wandering around for something suitable, "I mean, it is not like you have to match it with your skin tone or anything." Hanzo grinned cheekily, while at the same time, cursing himself that his own joke hurt to say out loud. Hanzo's little joke caught Genji offguard enough that he snorted and paused looking for suits for a moment just to take in what was said. Well, he wasn't wrong, but that wasn't exactly a good thing either, after all, it not having to match his skin tone meant it had to match something else. "Yeah, I just have to match it with the silver armor. Much easier." The sarcasm in his words were clear as day, but it was a more playful type, just some harmless teasing to bounce off Hanzo's joke. Indeed, it was going to be very difficult to find something that worked well with his current body. Clothing wasn't usually targeted at people who would be wearing armor under it, which was one of the reasons Genji didn't wear clothes very often. It did not help that he had very little experience telling what was good as far as formal clothing went, which just led to him staring at the selection without having any clue of how to begin. "... I guess I will just pick up whatever looks right and try them out." He sighed in defeat. There were some of the store workers around who were willing to help, but sadly they were in as much of a loss as Genji was. They made some suggestions and Genji figured they probably knew better than him so he just decided to roll with it so it could be done faster. "Having any luck, brother?" He briefly paused his search to glance at how his brother was doing. Indeed, it was quite tricky for him to imagine Genji wearing any clothing over this ridiculous armour of his. Not that he expected much in the first place, no, that wasn't it. Maybe the simple and stubbornly stupid fact that, with some appropriate clothes on, his brother would seem more human, so to speak, more normal, and in all honesty, Hanzo really didn't know how to feel about it just yet. Sure, he was glad, more than that even, to spend some time with Genji, like normal brothers did, like they should, just them hanging out and enjoying each other's company. But for some reason this all felt, weird, yes, somehow off. The fact that they were able to actually do this, being siblings, going out, no duty or anything attached to whatever they were doing now, it sounded like an unreachable fantasy, and still, here they were. Unbelievable. Absent and brooding, he looked through the variety in the assortment, feeling the fancy fabric, judging the patterns and cuts, catching himself looking over to his brother more than once to see how he was holding up. 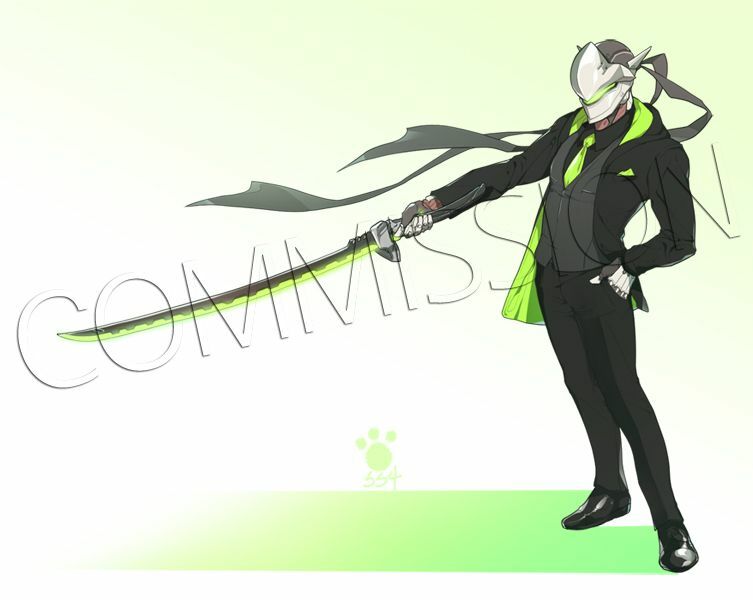 He shook his head at the question, a teasing smile appearing on his face as he noticed the effort that must've went into the consultation of Genji's evening attire. "Oh don't waste any thoughts on me, it seems this whole business seems to be much more difficult for you than expected. Not that it surprises me or anything." Hanzo told him to just focus on his own search, a teasing smile on his face. Genji smiled back behind his mask and went to try out some of the options he was given, which were plenty, to the point that it was kind of overwhelming. Being well-dressed was a more stressful thing than he was expecting, he wished he could just ask Hanzo to choose for him, but he figured he had to take care of things himself instead of just relying on him. It took a surprisingly long time and a lot of different outfits, but eventually he did manage to find a combination that he did actually like. He came out of the testing room wearing the full thing, hoping to get some critique from his brother. As far as he knew he might have been looking completely ridiculous in that suit and couldn’t tell. "Hanzo?" He called out for his brother, wondering if he was still around or if he was trying something out himself. Not wanting to risk getting the suit damaged because of Kaida, plus not wanting the fire lizard to both any of the other clients or the staff working there by giving her the freedom to move around, Genji told her to wait back at home. At which the lizard obeyed without much opposition, teleporting away from the store and back to the apartment. Hanzo immediately turned around as soon as he heard his name being mentioned across the shop. It took him some time to make out the source, well knowing that he had to look out for Genji, naturally, but absolutely not expecting to find him wearing something that could be classified as "classy". He was in awe, even if the moment lasted only mere seconds; the sight was just that foreign to him. What made the whole thing even more ridiculous was not that his brother was wearing a suit, no, the thing that almost made him feel physical pain was that his cyborg brother was wearing a suit. It looked wrong, and yet it fit him quite well, at least to some degree. His stunned expression turned rapidly into a cold frown as he walked up to Genji, shaking his head in a more than disappointed manner. As he approached the well-dressed cyborg, Hanzo waved his hand, as if he tried to shoo the look overall away. "Tacky, tacky, tacky," he growled, his eyes judgingly scanning his brother's appearance. Without elaborating his comment further, Hanzo began to straighten the green tie and shoulders, fixing the collar and buttoning the suit in a appropriate manner. "There. Now I can let you can run around without making a fool of yourself. A suit can be as classy and fashionable as you want, but if you don't wear it right, there is no point in wearing it." "And if you really want to up the ante I suggest you wear suspenders instead of a belt. It's classier that way." Hanzo was absolutely stunned, in a good way, which was a sign that Genji at least looked decent in that outfit. His behavior soon changed as he began acting disappointed all of sudden, the only thing coming from his mouth being the word "tacky". Really? It was just a black suit, what was so tacky about it? The scarf? Genji had thought that would make his outfit look more interesting than just wearing black and nothing else, but maybe it was too much. Then it turned out that all Hanzo wanted was for the tie and shoulder to be straightened up, the collar to be adjusted and the suit itself to be buttoned up better. One could almost see Genji's unimpressed expression behind the helmet, but it soon changed to some amusement. "You are such a mother." Genji joked, shaking his head and letting out a chuckle. "I assume outside of these little adjustements, it looks appropriate enough for your tastes?" "What about you? Found anything that strikes your fancy?" "This is not about my taste," he quickly added, a sly smile slipping through the stone cold façade he tried to maintain oh so stubbornly, "because if it were you absolutely wouldn't wear anything to support the flashy green...aesthetic. Never really was my favourite choice of colour." It was no secret that his brother loved this neon-green looks, remembering how ridiculous his hair looked back then; a sight so gruesome and horrific, that Hanzo was jealous of how brave he was to experiment with his outer appearance. Admittingly, he was kind of glad that his baby brother could now fully embrace his Tron fantasy and run around like a life-action Christmas ornament without anyone throwing judgemental looks at him. Well, anyone except Hanzo. But that was more of a personal thing. A low sigh escaped him as he turned around to let his gaze wander the shop again, for anything that "may strike his fancy". "I am not sure yet. It'd probably better to choose the classic, black and simple, not drawing too much attention to myself." It would probably be the better choice; as long as a suit fitted good, it felt good, and that was all he cared about, or should care about. Though, remembering those perfect-fit tailored suits, made out of the finest materials his family could afford, smooth velvet vests rounding up his every day look of designer shirts and Italian leather shoes which held more value than a real estate, the custom made arrow-head cuffs, and of course the jewellery a man would kill for. An absolutely dumpsterfire of a man. "Maybe, I want a little extravaganza, just, a touch of glamour," he finally said, mostly talking to himself as if reconsidering his previous choice. "Now that I think of it, different than you, dear brother, I shouldn't show up in something basic." Hanzo never really was a fan of Genji's choice of fashion, he had made that very clear at every given opportunity. Granted, now that he had matured a little, Genji could understand that he had exaggerated a little during his rebellious phase, yet, he didn't regret anything as far as that part was concerned. He lived life the way he wanted to and there was nothing to regret about that. "Green is a very harmonious color, I believe it suits me better than ever," he spoke with humor in his voice, as he knew his old self was anything but harmonious in nature. As for his own shopping adventure, Hanzo had not yet found anything that resonated with him and he almost went for a more standard choice... Until he changed his mind and decided to look for something more extravagant. Their upbringing led to Hanzo always being in the best money could afford and, at least to that degree, he had gotten spoiled. Genji, on the other hand? He wasn't one to care much about what material the clothes were made of, how unique everything was and just how valuable his accessories were, he just wore whatever he thought looked good on him. "If you say so. Just try not to blow your budget on this alone. Your tastes were always on the expensive side, to say the least." He quipped, before turning around to head back into the changing room. "I'll be buying this one, so I'll go change out of it. Thanks for your opinion." He began walking back to the changing room, hoping that Hanzo wouldn't take too long to find something to his liking. Genji might have grown to be more patient, but that didn't mean he liked wasting time, and having to watch his brother inspecting every single piece of clothing in the store definitely counted as a waste. What could he say? Yes, he liked this ridiculously fancy things, yes he indeed was able to tie beauty to wealth, but he also remembered that it was not everything. It was not hard to remember the weeks and months he had to hop from shelter to shelter, some more comfortable than others, not even skipping the 'shady' options opening up to him. Sometimes it had to be a 30 bucks motel room; huge money transactions caused suspicion and put him on the radar, so they had to be avoided as best as he could. The choice between sharing your bed with a cockroach or being on the run and covering your tracks for a few days wasn't really hard to make at the time. Now he didn't have to worry about any of it, there would be no one breaking through his entrance door when he decided to treat himself something nice for once. For Hanzo, this was freedom, a feeling he never thought he had missed before, and now that it was there and real, it put his past life into a different perspective. And there were still these expectations he had to fulfill. Genji never witnessed him at his lowest, has never seen how cheap and tacky Hanzo actually could be and the older Shimada wished that it would stay like this. So without further ado, right after his brother vanished back into the changing chamber, Hanzo immediately waltzed off to the section where he believed to find well-made, yet (hopefully) affordable suits, a clear picture forming in his mind the more he was looking through the options. Well, there was no one he had to impress at the ball, no one except himself, and maybe the other, more high-ranking guests that would attend. He wanted to give off a more sophisticated vibe; a little more "yes I am actually the heir of some kind of royalty" and a little less "once I fell asleep on a park-bench, drunk, crying, probably high..." You know the kind. The first thing which caught his attention was a low cut three-button-vest, much to his distaste made out of polyester, but the seemingly black material, appearing more blue when held against the light was much to his liking. The vest's cut was more than inviting for a shirt with a tab-collar, a decent but also fancy choice when paired with the right tie. Naturally, it had to be a white shirt, grey-scales made him look old anyway, additionally, it would only clash in a very unpleasing manner with the blue in the vest. Luckily there was a narrow-fit two-button jacket coming with it; even if this look wouldn't require him to wear it, though, the occasion did. Thinking a little about what kind of tie would go best with the shirt and vest, he quickly settled for trousers in a similar deep blue-almost-black colour, rounding it up with black strap leather shoes. Overall, a well rounded gala look, its choice saying "I can afford better but I do not want to." Now all that was missing was the perfect tie...and his brother's approval. After taking the clothes off and handing them out to the worker that had been assisting him through the whole process so that it could get ready for check-out, Genji went to see how Hanzo was doing, hoping that he had already managing to find something to his liking and that he wouldn’t have to spend about half an hour waiting for it. As much as he had learned to be patient, there were some things that were just too much for him and that was one of them. Somewhat to his surprise, Hanzo was already dressed up and, well, the appearance was nothing that Genji wasn’t used to seeing from his older brother. Maybe a little cheaper looking, but for that he was grateful. In a way, it was a little nostalgic to see him dressed in formal clothing again after so long and being able to see him like that again after he came close to simply drowning in his own grief, it was a relief that further gave Genji hope for Hanzo’s future. "You talk about my green, but you are just as guilty with your blues." Genji let out a chuckle as he further inspected Hanzo’s outfit, though he didn’t really have the eye for this kind of thing. "Nicely done, brother. If I did not know you better I would think that you were aiming to impress someone with that." Genji always liked teasing Hanzo about his perpetual single status, as his brother dedicated himself to the clan too much to enjoy life like he did, which also meant not many flings or the opportunity for love to bloom. Of course, Genji always knew Hanzo’s interests went in a different direction from his, but even when he had prodded him about pursuing a relationship he had always gotten refuted. Thinking about it now, he wondered if this particular trait of Hanzo’s would change in Pandora as well. His brother's reserved but positive response meant more to him than he was willing to admit, letting an unknown weight slide off his shoulders and easing a certain anxiety about the upcoming event. It was no professional's statement, but Hanzo knew that Genji's commentary was sometimes worth more than that of any expert, because he could always count on his sibling being honest with him...maybe a little too honest at times. Looking at his choice of colour, he chuckled himself, acknowledging the indeed rather predictable pattern. It was true though; he did have a thing for it, perhaps both of them even for similar reasons, that being the dragon spirits of course, but at least he didn't go out and dyed his hair in a obnoxious blue-ish tone, though it'd probably suit him better than Genji's ridiculous green. "You may be right, but in my defense, in contrast to your greens, my blues at least flatter my skin tone and do not make me look like a freshly harvested vegetable." Admittingly, it felt weird to jokingly tease his own brother; it was something he was only used to from one side, and after Genji's evidently death, he had a very hard time to mock his brother, even now. After all, one does not make fun of the dead for they should be allowed to rest. It would probably still take some time until he was fully comfortable to throw some brotherly teasing back, but this was a good start. To his other comment though, Hanzo's expression returned to the stony face which could make a child cry, clearly not amused about the implication his brother was going for. But he couldn't really hold a grudge against him for long, especially for something he was already used to. "If you are talking about a collective of people I neither know nor care about, then yes, you are right, maybe I do want to impress them a little. If you imply me to clean up for a specific person, then yes to that as well." With that being said, a smug smirk appeared on his lips as he straightened the vest once again, striking a pose and clearing his throat. "And that specific someone would be me, thank you very much." Hanzo not really being interesting in dating hasn't been a big secret or anything; it was more ammunition for his brother to make jokes about it than anything else honestly, but he didn't mind. Different to Genji, he didn't see the need in being that outgoing or, perish the thought, desirable; these were unimportant and unnecessary distractions, distractions he never had the time or mindset for anyway. And he was convinced that it'd stay that way. After all, only an idiot would attempt to charm him, without success, most definitely.